Not even Earth's Mightiest Heroes can escape death. The streaming service will launch later this year on November 12! Revealed at Star Wars Celebration, see how Marvel's 'Darth Vader' comics originated the purge troopers and the Second Sister! Where we last left off with the God of Thunder. February is Black History Month, and to mark the occasion, Langston Belton is offering up a special Black History Month reading list highlighting some of Marvel’s black characters and creators! Hear what the stars have to say about 'Captain Marvel' on Earth's Mightiest Show! 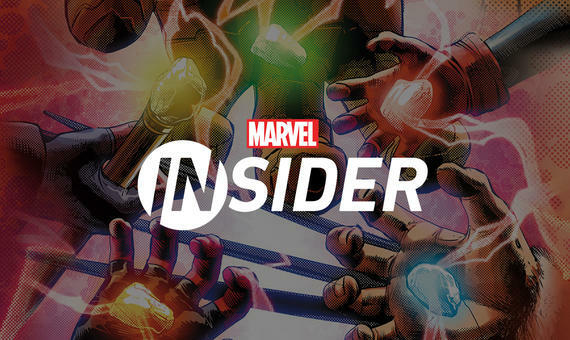 Lorraine and Langston break down how Marvel has predicted some real-world tech! With Marvel Studios’ 'Captain Marvel' in theaters on March 8th, Earth's Mightiest Show checks out a ton of cool new merch! Musical artists Rocky and Ross Lynch, of the band The Driver Era, stop by Earth’s Mightiest show to talk with host Langston Belton about their new tour and then take a quiz to find out which Marvel character would be the best fit to join their band! Langston sits down with Ricky Whittle, star of “American Gods” on Starz, and puts Ricky to the test in a game of “God or Not,” where he tries to figure out whether characters like Odin, Freyja, Malekith, & Hercules more are indeed gods or not. The cast of Marvel Rising: Heart of Iron talks about the new hero in their world—Ironheart! Watch Marvel Rising: Heart of Iron now on Marvel HQ! Showrunner Joe Pokaski lets us in on the big secrets coming for Tandy and Tyrone in Marvel’s Cloak & Dagger Season 2! In honor of today’s date, 4/4, we celebrate The Fantastic Four and some of their most unbelievable villains. Lorraine heads to Midtown Comics to ask fans whether they can tell the difference between the real villains and the phonies! Need a refresher? Check out this ASAP Recap of all of Season 1 of Marvel’s Cloak & Dagger! Catch up on Marvel’s Cloak & Dagger Season 1 now available on Freeform.com, Hulu, and on demand. Will Tyrone escape the police? Has Tandy outrun her past? Is Brigid O’Reilly dead or something else? And WHERE THE HECK IS CONNORS? See an *EXCLUSIVE CLIP* and lots more about the Marvel’s Cloak & Dagger Season Premiere! Our own Agent M a.k.a. Ryan Penagos hits C2E2 in Chicago for cosplay, comics, creators and all the latest from Marvel! Sofia Wylie, voice of Riri Williams aka Ironheart in Marvel Rising: Heart of Iron, talks about her role and Ironheart’s journey in the animated feature! Watch Marvel Rising: Heart of Iron, premiering April 3, on Marvel HQ. Langston & Josh play LEGO Marvel Super Heroes, LEGO Marvel’s Avengers, and LEGO Marvel Super Heroes 2 from the LEGO Marvel Collection on PS4 and Xbox One. See how Malekith the Accused has pulled together the Universe’s worst baddies, and how the heroes will be drawn into the action! Retired MMA legend Georges St-Pierre, who played Batroc The Leaper, talks about his Marvel fandom and how he sees similarities in the way he and Iron Man train & fight. They play a game of What's that Sound? Oscar-nominated actress Annette Bening talks with Earth’s Mightiest show host Lorraine Cink about her role as “Supreme Intelligence” in Marvel Studios’ Captain Marvel. Meet the super company that cleans up after super hero destruction, Damage Control! Earth’s Mightiest Show is sponsored by Visible. From Skrull transformations to Goose the Cat to Captain Marvel herself, see how the Visual Effects from Marvel Studios' Captain Marvel are brought to life! Marvel writer Greg Pak stops by to talk about his new four issue comic book series “War of the Realms: New Agents of Atlas” as our heroes try to protect the Asian continent! Pre-order War of the Realms: New Agents of Atlas, which releases in May!